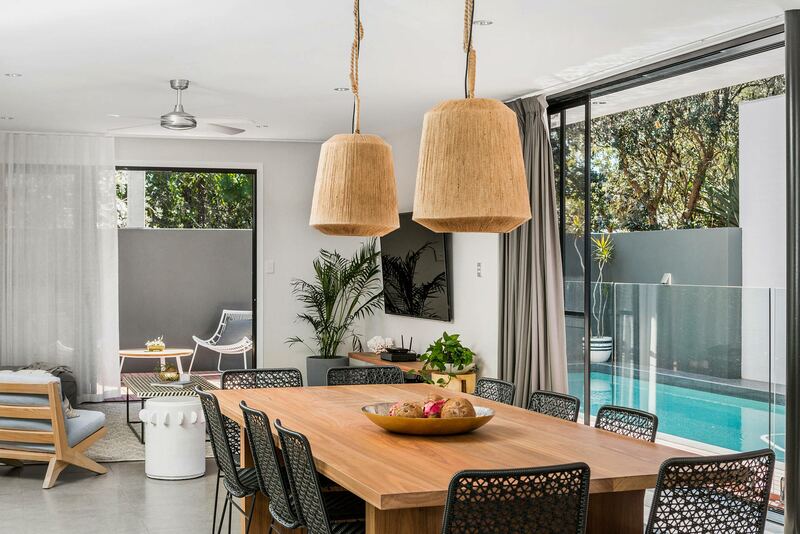 This stunning 3 bedroom, 2 bathroom villa is Byron Bay living at its finest. Enjoy a short stroll down to pristine North Beach or have a wander around Habitat, an exciting new business district with vibrant restaurants and shops. With a generous open floor plan, spacious bedrooms, and a gorgeous outdoor deck with swimming pool and spa, Catalina’s is the perfect place to entertain or unwind with family or friends. 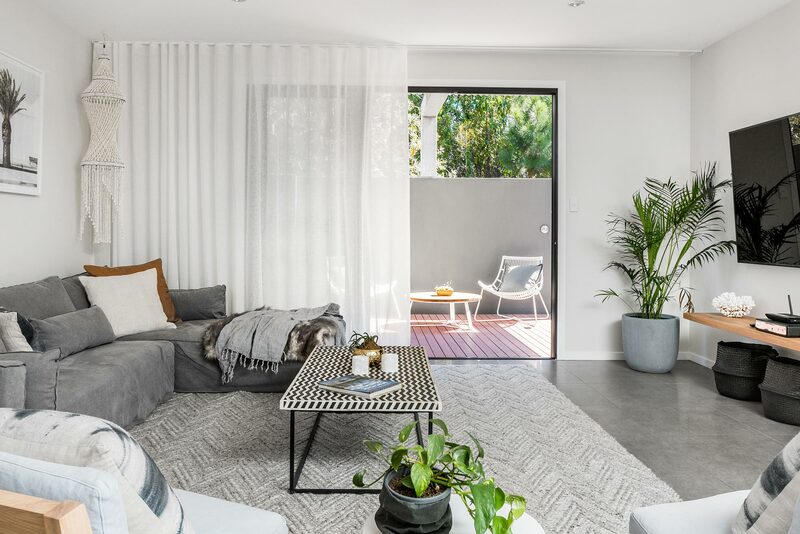 Beautifully restyled with a modern, contemporary design, the villa boasts a large open-plan space downstairs with a high-end chefs kitchen, multiple dining areas and a comfortable living room. Never miss your favourite binge-worthy drama, thanks to the property’s NBN broadband and complimentary Netflix. Sliding glass doors provide ample natural light as well as access to the spacious outdoor deck, with separate lounge and dining space, swimming pool, and spa. 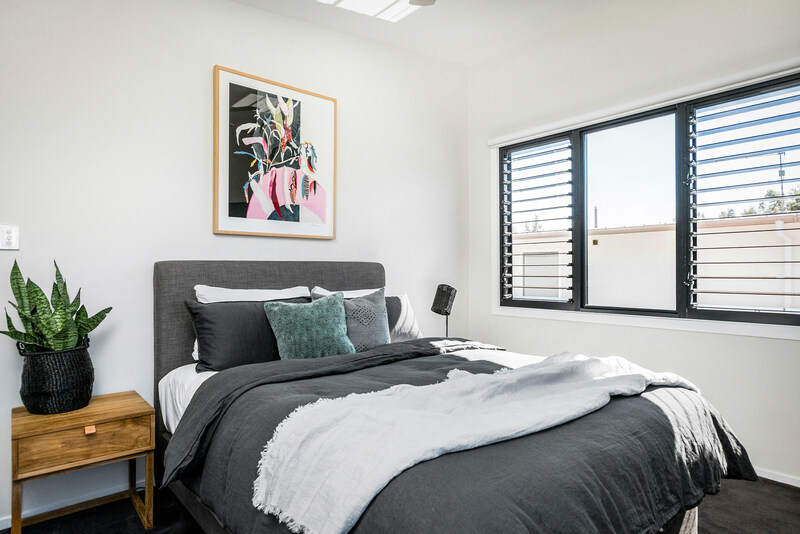 Upstairs, the enormous master suite offers a king bed and 2 singles which can be made as 2 kings or split into 4 singles, creating a flexible space ideal for a family or group of friends. The master ensuite offers dual standing shower heads as well as a luxurious, freestanding bathtub. 2 additional bedrooms are similar in design, both with 1 queen bed, sharing a second spacious bathroom. The garage has been built in and features a lounge, toilet, and fold-out couch for an adult or up to 2 children. 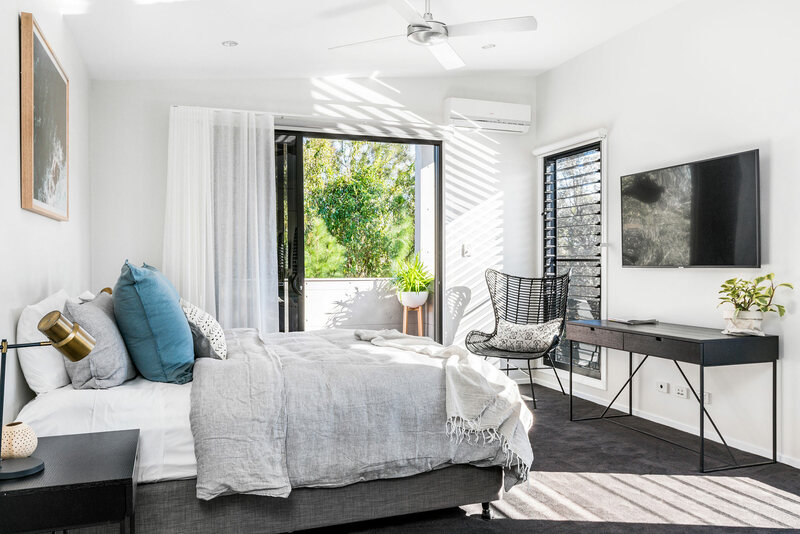 Staying at Catalina’s puts you in an ideal location, just a short drive into the Byron Bay CBD. Better yet, leave the car at home and hop aboard the world’s first solar train! The nearest station is a mere 1-minute walk away and 10-minute trips into the centre of town depart every hour. There is also plenty to enjoy right in the neighbourhood, from the Gourmet Traveller-reviewed Barrio restaurant to award-winning Elements Resort on North Beach. 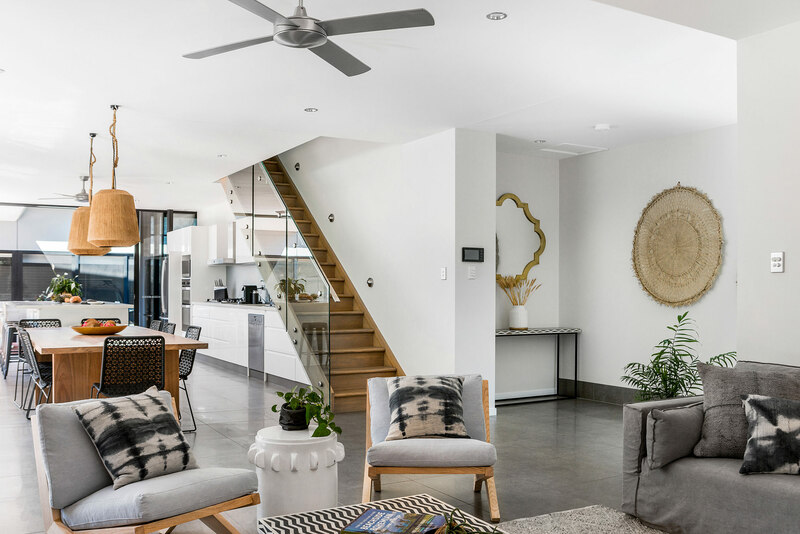 Polished concrete floors are carried throughout the downstairs space, connecting three distinct areas within the spacious, open floor plan for cooking, dining, and living. Is there anything more inviting than a super-sized, plush sectional sofa? 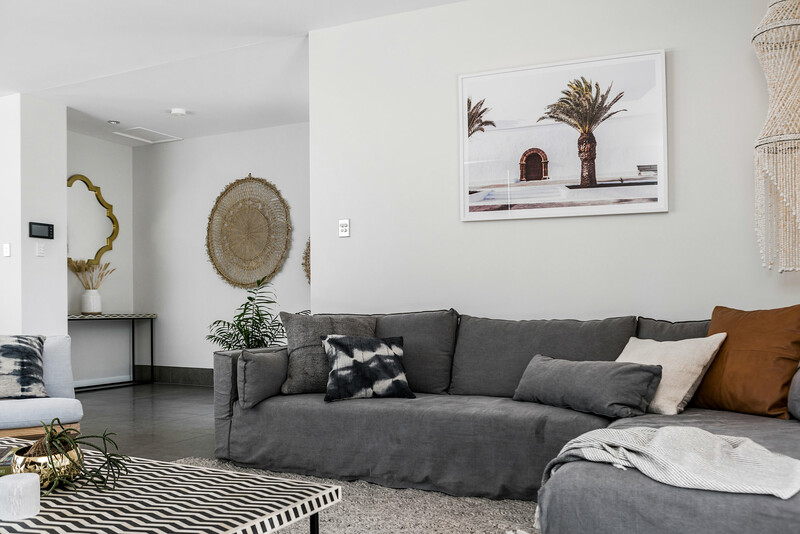 There’s plenty of room to settle in for the latest must-see TV (complimentary Netflix is provided) or play a rousing game of cards with your friends or family. Sliding glass doors provide easy access to the outdoor deck or, if left open, allow a gentle ocean breeze to float in. 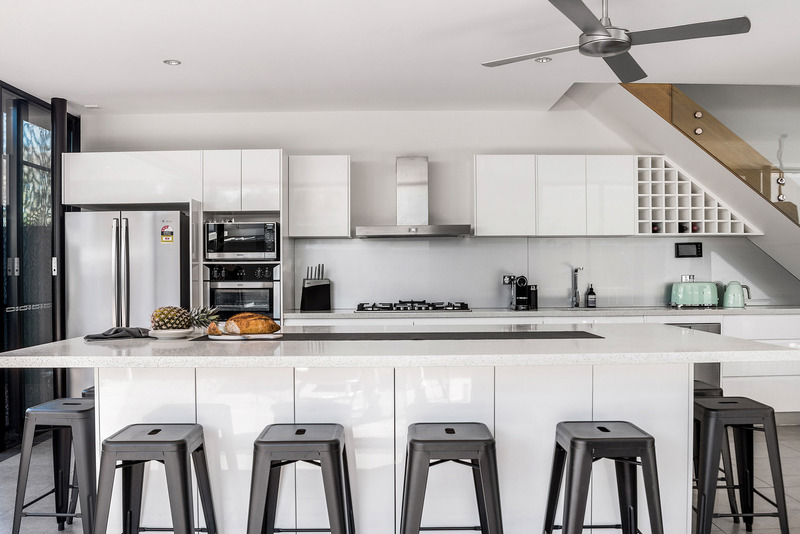 Sleek and sophisticated, Catalina’s kitchen blends high end, stainless steel appliances with bright white cabinets and soft-hued, granite countertops. As functional as it is beautiful, the kitchen is well appointed with a large combination fridge/freezer, gas cooktop, double oven, dishwasher, and microwave. 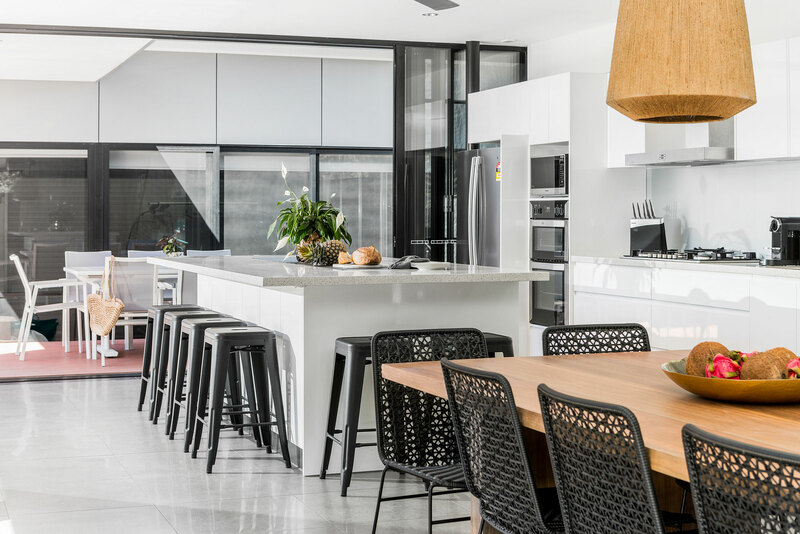 The enormous kitchen island serves as a roomy place to prep or simply gather for coffee and conversation with the entire group. The formal dining table is just off the kitchen, a beautiful custom wood piece with space for 10 to dine comfortably. The deluxe master at Catalina’s is a uniquely appointed bedroom, created with flexibility in mind. 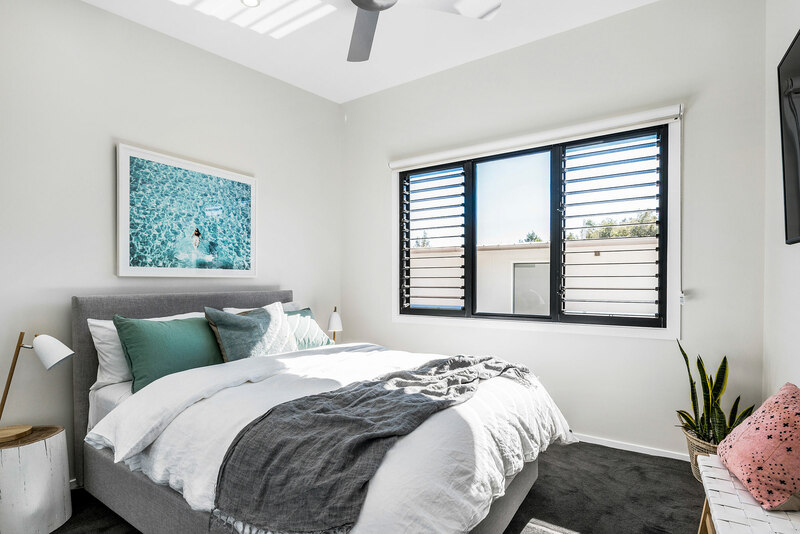 Set up as a king and 2 singles for a small family, the room also be configured as 2 kings or split into 4 singles, ideal for 4 friends or teenagers to share. For added comfort, the master has reverse cycle air conditioning as well as heating, plus a Smart TV and its own luxurious ensuite with a freestanding tub. A further 2 queen bedrooms are also upstairs, both with soft carpeting, ceiling fans, ample natural light, and luxurious new linens. There is a second, shared bathroom upstairs as well. An additional sofa bed is available in the converted garage, suitable for 1 adult or 2 children, and available for use on request. 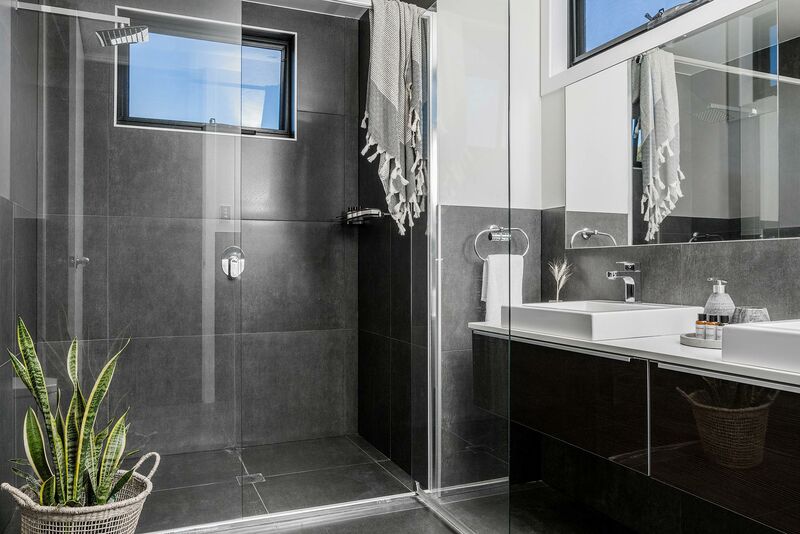 The master ensuite is a spa-like retreat, with high-end fixtures, double vanity sinks, a dual shower-head, and a stunning, freestanding bathtub. 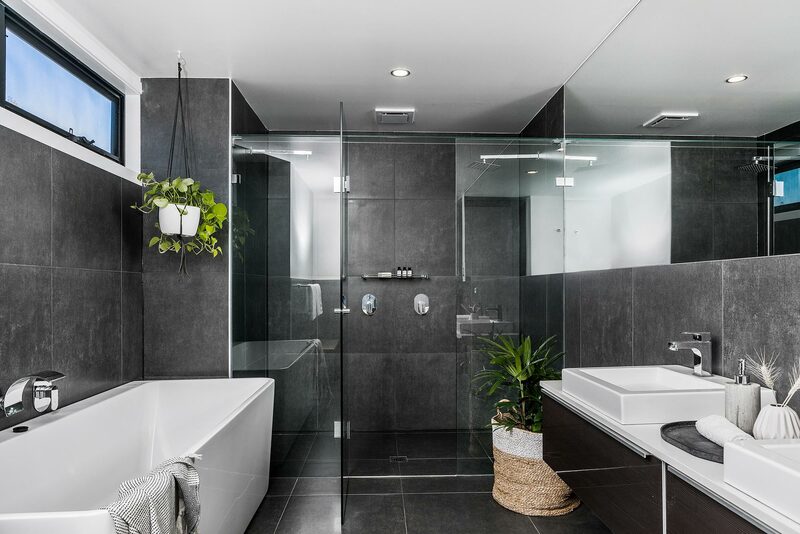 Also upstairs, the shared bathroom is similarly designed, with a calming gray and white colour palette, large standing shower, and double vanity. There is an additional powder room with toilet in the garage, perfect for guests to use after enjoying the pool and spa area. Downstairs, the open floor plan living room flows seamlessly outside via sliding glass doors, connecting both spaces for easy entertaining. At one end of the deck is a barbecue and dining table suited for up to 8, with cover providing shade. Along the sun-drenched side of the villa, enjoy the comfortable lounge seating area, ease your surf-strained muscles in the relaxing spa jacuzzi, or take a refreshing dip in the swimming pool. 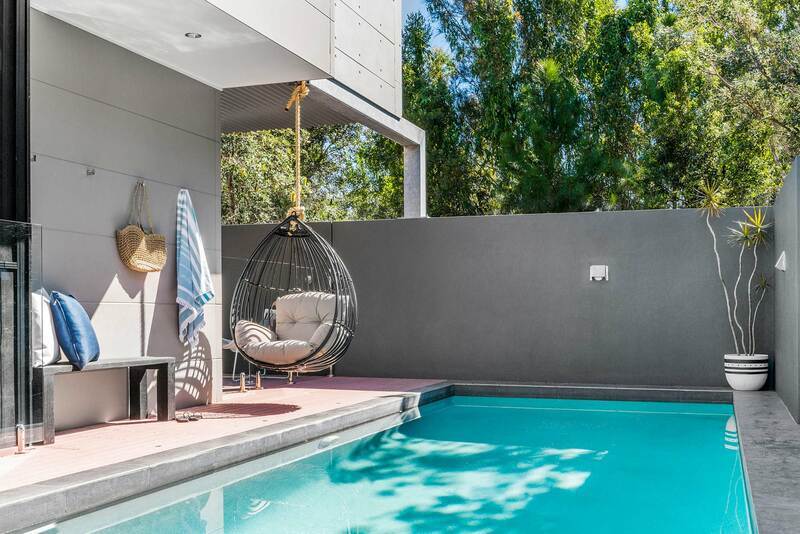 It’s easy to gather and unwind here, soaking up the sun on the loungers or simply dipping your toes in from the cosy poolside hanging chair. The garage is not available for parking - guests are to park on the street. 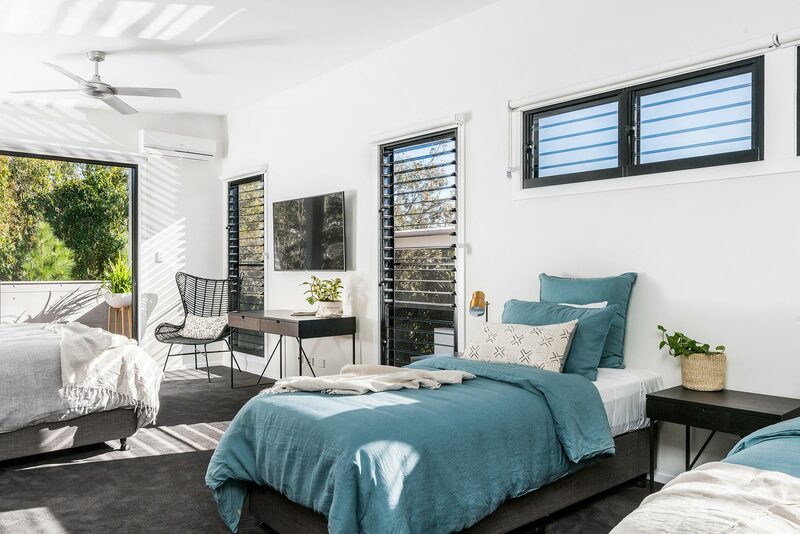 Just 3 km north of Byron Bay’s CBD, Catalina’s is ideally located in a lively, new neighbourhood near North Beach. Exciting new establishments are opening all the time, from boutique breweries and inspiring homewares to casual bars and popular restaurants. Enjoy a low-key feed just across the street at Sun Bistro or check out Barrio, recently reviewed by Gourmet Traveller (link to: https://www.gourmettraveller.com.au/dining-out/restaurant-reviews/barrio...). The nearby Habitat business precinct is home to a number of great restaurants, cafes, and shops, while a short stroll will bring you to the award-winning Elements Resort on North Beach for a sunset cocktail. Many beautiful beaches and local sights are within a short drive from Catalina’s. To reach the centre of town, leave the car at home and take a quick ride on the world’s first solar train (link to: http://byronbaytrain.com.au/) instead! 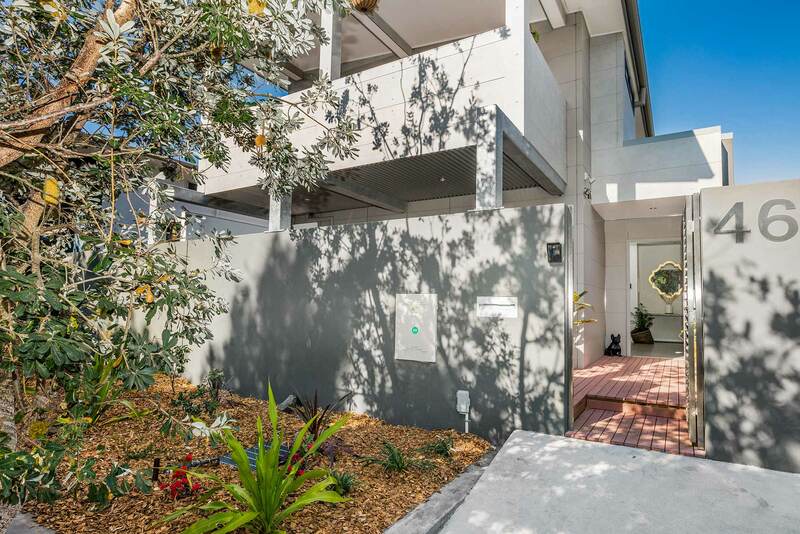 The nearest station is a mere 1-minute away and 10-minute trips to the Byron Bay CBD depart every hour. "The location is great, the house was beautiful. Everything you needed was there. Coffee pods were much appreciated! Air con in the rooms may be good in the hotter months, we got a lovely breeze which was great Overall it was really wonderful and I would recommend it to everyone"
Thank you for such an incredible place - we all enjoyed it so much and having such a lovely home to stay in meant we could really relax. Everything was just perfect so it was indeed 'a perfect stay'! We were just thrilled with everything and will be happily recommending Catalina's to our family and friends.